We would like to invite US middle and high school teachers, to apply for a 2 day workshop at the Adler Planetarium in Chicago on the 8th and 9th of August 2013. Travel, hotels and working meals will be paid for and a generous $1000 stipend should cover any additional costs. The first $500 installment will be paid at the end of the workshop. During the workshop participants will be introduced to the array of Zooniverse projects and the existing educational resources available to help bring them into the classroom. Members of the development team will provide insight into the process of project selection, design and development that allows a scientific dataset to be transformed into an interactive citizen science project. In addition, there will be live virtual presentations from at least five science teams, giving the participants the opportunity to ask questions and interact with researchers from a variety of disciplines. Participants will have the opportunity to share any experience they have of using Zooniverse projects in the classroom and will begin developing a lesson plan for the project of their choice. This lesson will need to be completed and submitted within 4 weeks of the workshop, along with a blog post for publication on the our blog describing their experience in promoting the Zooniverse. After this the second $500 installment of the stipend will be paid. The lesson should also be tested in their classroom, by the end of the 2013-2014 school year and a simple evaluation questionnaire submitted. Teachers who are interested in attending this workshop should apply by the 7th of June 2013, they will need to include 500-word summary explaining why they would like to participate and how they plan to spread the word about the Zooniverse to their colleagues and local communities. Successful applicants will be informed by the 12th of June 2013. Applications for the Zooniverse Teacher Ambassadors Workshop are now closed. Thanks very much for your interest. We’ll be reviewing applications next week. It’s very exciting, and a little bit scary, but we’re going to begin offering online educator workshops! The first two will occur on the 30th of March and the 6th of April and we’re looking for volunteers who would like to participate. The workshops aim to introduce educators to the range of citizen science projects available on zooniverse.org, our new website ZooTeach and the new classroom interactive tool for Galaxy Zoo, the Navigator. They are aimed at teachers, but anybody who is interested in using citizen science in a informal education setting, after school club, scout group or maybe with their home schooled son or daughter, is more than welcome to join us. We will be using Google + Hangouts (http://www.google.com/+/learnmore/hangouts/), which can be freely accessed by anyone with a Google email account. The time of the workshops has yet to be decided as we were unsure what would work best with different time zones, but it will last for approximately 2 hours. If you interested in participating please email education@zooniverse.org, including the date that suits you best and your location and we will do our best to set up a time that work for as many people as possible! Each workshop will have a maximum of 10 participants, but we may decide to do several smaller groups in different countries. I hope to meet some of you online in the not too distant future! We have had a great response from teachers in the Chicago area to our offer of making classroom visits. Yesterday marked out first visit to West Ridge Elementary in Chicago’s Rogers Park neighborhood. After consulting with Ms. Tschaen, the third grade science teacher, we decided to present Seafloor Explorer and Moon Zoo to the students. Apologies in advance for the lack of pictures, we were having way too much fun to think about proper documentation. One of the challenges while preparing for this school visit was figuring out a quick and easy way to explain crowdsourcing to third graders. I scoured the web for a nifty interactive or video,but in the end decided a low-tech solution, a story, was the best solution. I told the students that when I was a kid my friends and I loved to play soccer. One we were planning to play but my Mom told me I wasn’t allowed to until my room was clean. When I was a kid, the floor of my room generally resembled a soup of toys, clothes, books, and papers. Cleaning it was no small task and usually entailed the better part of a whole day. I asked the students how they thought my friends and I solved the problem. Every group offered the solution that we could work together to clean my room and then have time to play soccer together. Voila! The principle of crowdsourcing quickly and easily explained. Granted, I settled on a somewhat simplified definition, that crowdsourcing is getting a bunch people to help solve a bigger problem, but it did the trick and the students “got it”. Next we were ready to set the stage with how Zooniverse projects utilize the efforts of many to solve problems involving large datasets. With the first two classes, we decided to test a newly developed Seafloor Explorer classroom activity. For time’s sake we modified the activity by focusing on species identification and left out ground cover identification component. After a 10 minute group discussion of Seafloor Explorer’s science goals and how to identify the different animals we were off and running. Just like with the example of cleaning my room and soccer, the students called out that we needed more people to identify the 30,000,000 + images comprising this project’s dataset. Success! They were challenged to work together as a class to beat the time it took me to identify species on 40 different cards. Working together each class about 1/3 of the time it took me to do it alone. Double success! Laura engaged the third class in lunar adventures using Moon Zoo. Students learned a little bit about the history of moon exploration. Next they discussed craters and the different ways we can find out information about our nearest celestial neighbor. After a brief introduction to the Lunar Reconnaissance Orbiter, they divided into groups to explore individual portions of the moon. Students worked together to mark any craters larger that their thumbprint on their section of the moon. They tallied the total number of craters on their group’s individual moon section and compared them to the other groups’ moon sections. Finally students identified potential sites for a lunar lander to touchdown. So, what did we learn from our adventures with third graders? I’ve long suspected that, while students certainly have the ability to participate in most any Zooniverse project, it sometimes helps to introduce the project “offline”. This may help students feel more secure when they begin participating on a project’s website. Many teachers I’ve spoken with point out that students don’t always feel empowered in their practice of science. By frontloading students with a little bit of a project’s background content and walking through the classification task together, students can easily see that they are more than capable to make an important contribution to current scientific research. Working as a group also fosters a sense of community that we, as a class, are working together to help scientists make important discoveries and maybe even making some important discoveries ourselves. I’m sure that there will be many lessons to learn over our remaining visits to Chicago-area classrooms. Last week we had the pleasure of speaking to a class of pre-service teachers at Loyola University in Chicago. After discussing the basics of citizen science and the origins of Zooniverse, the teachers took time to explore projects of their choice. Always being keen to show-off Zooniverse’s new educational offerings, we then demonstrated ZooTeach and a beta version of Galaxy Zoo Navigator. Many of these pre-service teachers are preparing to begin or are in the midst of their student teaching placements. We spent the rest of the class discussing ways they could incorporate Zooniverse projects into the classroom, specifically how they could be used to facilitate scientific inquiry. Over the course of the discussion the notion of “right” answers emerged. This was a real ah-ha moment for me. I suddenly remembered my own fears of getting the wrong answer as a first-time Zooniverse user. Whether a Zooniverse volunteer or a student, encountering a project for the first time can be a bit intimidating. There is the fear, however irrational, that by submitting an inaccurate classification you could single-handedly break science. If you look closely all of the different Zooniverse project sites are peppered with reassuring messages of “don’t worry you’re good at this” and “just give it your best try”. Laura has previously blogged about how Zoonverse projects are used to engage museum audiences at the Adler Planetarium on the Planet Hunters blog. Whether working with members of the public or groups of students, we often encounter “Did I get it right?”. This is a tricky question to answer; Zooniverse volunteers are supplying the answers from which scientific interpretations are drawn. Projects employ measures of checking for accuracy. That’s why any given object be it a galaxy to classify or a bat call to listen to, is looked at by more than one individual. The “power of the crowd” yields more accurate results than one single person. Needless to say the idea of crowdsourcing as a quality-control mechanism is easier to convey to adults than to a bunch of eleven year olds. It’s difficult to get students over the hurdle that, in the instance at least, being right isn’t so important. I don’t know about you, but this leaves my head full of more questions than answers. How do we as educators model for students that science can’t only be about getting the right answer? How do we encourage students that being wrong can be oh-so-right? Taking a risk of being wrong is brave and necessary to advance this thing we call science. So how about it, how do you encourage a risk-taking culture in your own classroom or other learning environment? This trusty steed could bring Zooniverse education to your classroom. Photo by Rhett Sutphin. During our pre-Zooniverse days, Laura and I both worked with students. I worked as a museum educator and Laura as a math teacher. Being educators in an office of developers and designers is wonderful because of the opportunities to engage in great conversations about marrying technology and educational opportunities within the wide world of Zooniverse. Sometimes though, you miss the smell of school lunch and want to get in front of a group of kids. Thus Laura and I thought it would be fun to go on the road and make ourselves available for classroom visits. 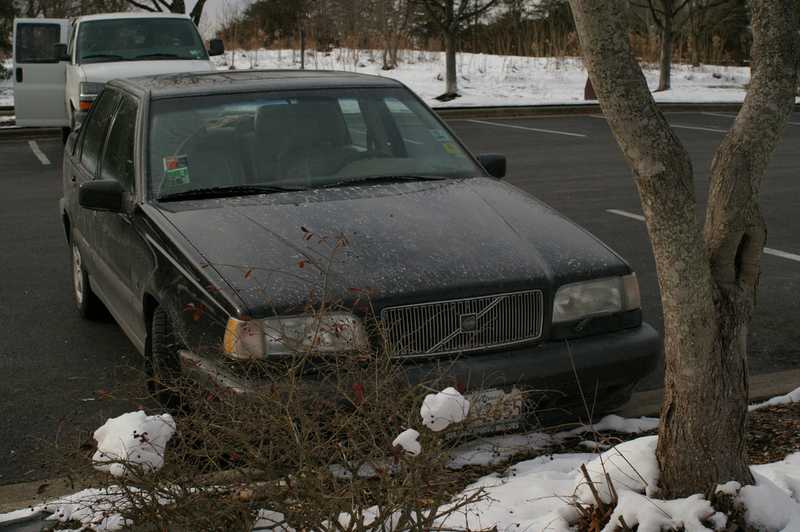 Sadly no fancy tour bus for us, just the CTA or my old Volvo 850s. Would your students like to discover an exoplanet? How about explore the Serengeti? Zooniverse educators (aka Kelly & Laura) want to come to your classroom and share the exciting world of citizen science with your students. Let us show your students how they can contribute to scientific research via Zooniverse’s collection of online citizen science projects. We are reserving a limited number of days in February, March, and April to visit schools in the Chicago area (City of Chicago and immediate suburbs). Requests will be taken on a first-come, first-served basis. Participation will also be determined by educator date availability and location of school (we need to be able to get to you). Preference will also be given to schools requesting more than one session on a day. Sessions can range from 20-45 minutes depending on the topic. We’ll work with you to tailor a presentation and related activity to fit the needs of your class. We can speak about citizen science as a research method or speak about specific projects. If like to request a classroom visit, please register your interest by answering the questions below. UPDATE: Thanks for your interest in Zooniverse education classroom visits. As of February 21, we have reach capacity for visits this spring. Just like our science team colleagues (Planet Hunters and Cyclone Center ) educators also attend professional meetings and conferences to share work, learn about the latest advances in our field, and to meet with friends and colleagues. This past week Laura and I spent three days at the Association of Science Educators Annual Conference at the University of Reading. 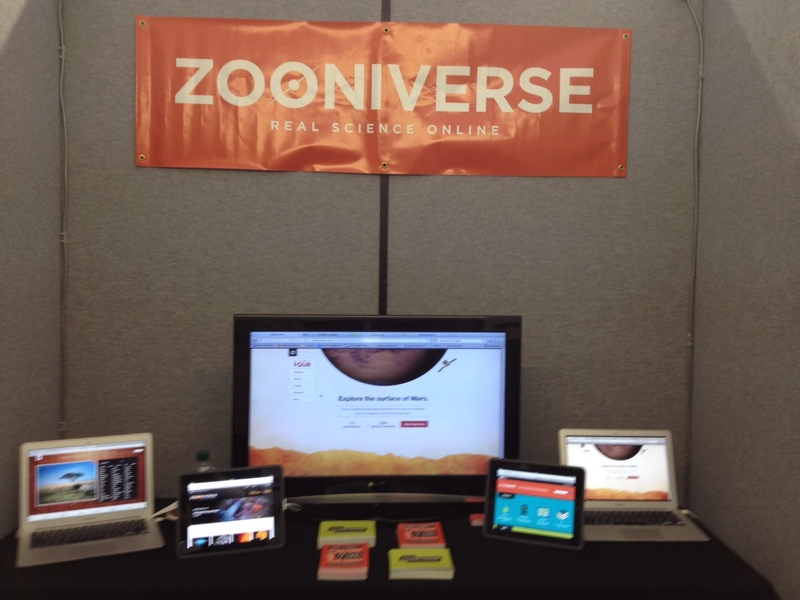 Our primary aim for attending ASE was to spread the word about ZooTeach and other upcoming Zooniverse education resources. ZooTeach is a new website containing resources and lessons relating to Zooniverse projects made for teachers by teachers. 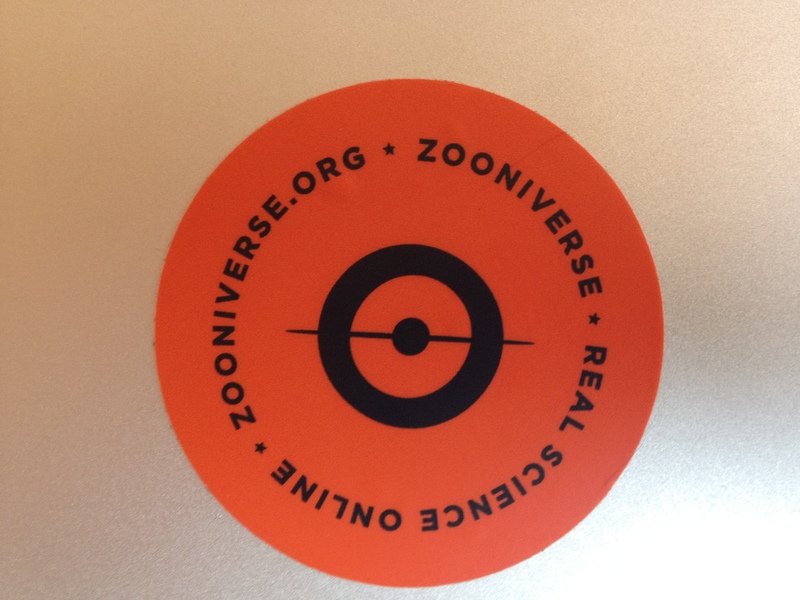 It’s early days for the online Zooniverse education community, so we’re trying to get the message out wherever we can. Our corner of the ASE exhibitors hall. Speaking to teachers was far and away the best part of ASE. Many teachers stopping by our booth already use Zooniverse projects in the classroom. Other teachers were excited to find a new free resource allowing them to bring real data and the chance to make contributions to current scientific research to their students. Laura and I also spoke with many of our science education colleagues about potential collaborations in the future. There are a lot of exciting things on the horizon In fact, if you’re a classroom teacher who might be interested in helping us test some of these new resources, drop us a line! First a quick introduction, I’m Kelly, one of the educators on the Zooniverse development team based at the Adler Planetarium in Chicago. Recently we’ve had some opportunities to speak with teens about the awesomeness of the Zooniverse and citizen science in general. First-up were freshman from the Air Force Academy, a Chicago Public high school. For the last three years the Adler Planetarium has partnered with AFA to develop a series of field trip experiences for their freshman class. The first trip is billed as a “behind the scenes” look at the Adler where students attend sessions presented by different departments within the planetarium. Web-developer extraordinaire Stuart and I spoke to 80 students in four 25 minutes sessions about all things Zooniverse. We introduced students to citizen science, crowdsourcing, and multiple Zooniverse projects. To demonstrate the power of the crowd, each student guessed the number of M&Ms in a jar (1,034 painstakingly counted by yours truly). We averaged students’ guesses and, in most instances, this average was closer to the actual number than their individual guesses. After a brief demonstration on the transit method of planet detection, students dove into Planet Hunters. The program ended with students giving feedback about what they liked and what they would change about the website. We’ll use their feedback as we develop educational resources for Planet Hunters. Zooniverse student outreach isn’t limited to the walls of the Adler Planetarium. On cold November Friday, Laura, Ed, and I headed out to Downers Grove South High School in the suburbs of Chicago. Each year the school’s library teams up with an academic department to participate in the American Library Association’s Teen Read Week. This year it was the science department, so Zooniverse joined organizations like Argonne National Laboratory to speak with freshman and sophomores about various sciencey things. Admittedly there was some stiff competition for student attention, namely live animals. A sloth availing itself of the facilities proved quite fascinating to the students. While not directly related to our outreach endeavors, we did learn that sloths only go number two once a week (file that away for your next bar trivia or Trivial Pursuit game). Overall our participation in Teen Read work at Downers Grove South High School was a huge success. All told over 600 students classified galaxies in Galaxy Zoo, searched for extrasolar planets in Planet Hunters, counted and measured seastars in Seafloor Explorer, and previewed Snapshot Serengeti. We’re looking forward to more opportunities to work directly with students, just maybe sans sloth and with a smaller jar of M&Ms.